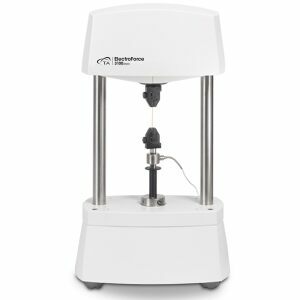 Measuring less than 50.8 cm (20 inches) tall, the ElectroForce® 3100 test instrument is the smallest in the ElectroForce product family. The 3100 will fit on a desk or table-top, and it is extremely lab friendly thanks to its practically maintenance-free operation. The 3100 instrument is well-suited for micro-characterization of materials and devices because of its exceptional control resolution up to 22 N static maximum force. Excellent control from gram-force loads to 22N, providing versatility for a variety of tests.